I was contacted by Amber Brooke on Model Mayhem the week prior and she was interested in shooting with me. I told her my availability and she decided to drive up to Riverside from San Diego to shoot at the studio of my friend Rey Sison. We ended up shooting several looks, but this shot happens to be my favorite from the shoot. While this is a very elaborate looking shot, it’s actually pretty simply to pull off. This was shot indoors on a marble tile floor in front of large doors opening to the backyard. The marble is black and grey and gives off a decent reflection. The shot was taken on 2011-06-26 at 1841 PDT, so there was a good hour of sun left in the day. The sun was setting right on an axis behind the model, with trees blocking the sun for the most part. 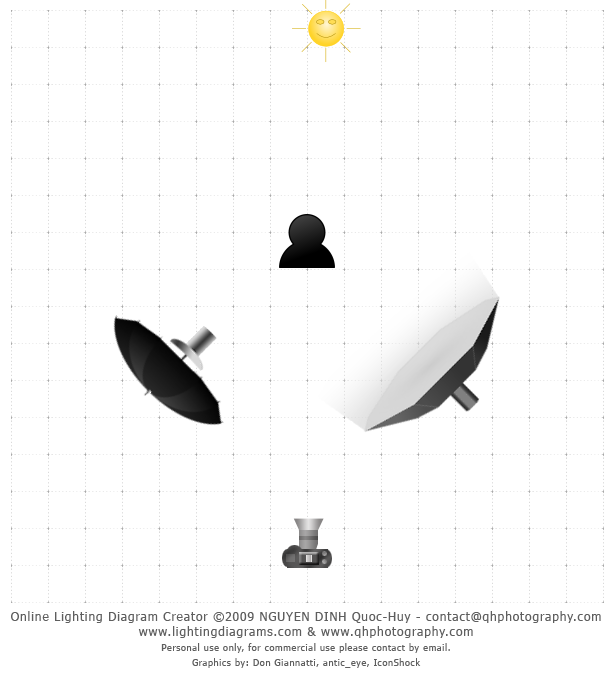 This was a simple two light setup with two Einstien 640 strobes (by Paul C. Buff). One had a PCB 47″ octabox (camera right) and the other a PCB 64″ silver PLM (Parabolic Light Modifier) with a white diffuser (camera left). The PLM on camera left was more the key light and was aimed directly at the model. The octabox on camera right was more fill and was actually pointed a bit more down at the floor in front of the model. I wanted to get a bit more light on the floor to bring out the reflection and to also get some light to bounce off the floor and hit underneath the model to soften inherent shadows. As far as the sunbeam leaking through the trees, this was the effect as-is, straight off the camera with no enhancements. I was just lucky to get that ray of light coming through the branches. EXIF shows f/6.3 which is stopped down just a tad (shooting with the 70-200 f/2.8L IS II) and explains how the ‘starred’ effect happened (shoot small aperture to get the star effect with lights). The only things I might have done to enhance this photo would have been to 1) pop just a tiny bit of hair light with a strobe and a 10 degree grid or even a snooted Speedlite, and 2) hit the tree behind the model with a strobe just to bring out a small amount of detail out of the backlit tree. But for the most part, I’m very happy with this shot. Exposure Data: 1/200sec, f/6.3, ISO 100 @ 70mm. Technical Data: Canon 5D Mark II, Canon EF 70-200 f/2.8L IS II, PocketWizard MiniTT1 with AC3 Zone Controller, two Einstein 640 strobes with PocketWizard PowerMC2 receivers.